Mar 12 20:30: Magnitude recalculated from 5.1 to 4.8. Hypocenter depth recalculated from 132.0 to 136.0 km. 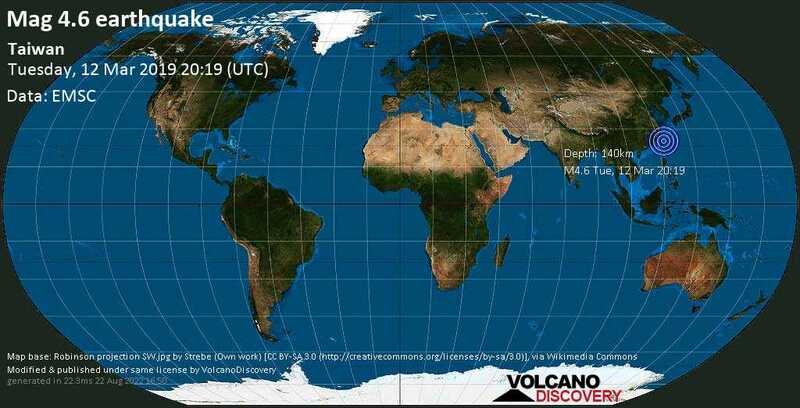 Mar 12 20:37: Magnitude recalculated from 4.8 to 4.7. Mar 12 20:58: Magnitude recalculated from 4.7 to 4.6. Hypocenter depth recalculated from 136.0 to 139.0 km. Hypocenter depth recalculated from 139.0 to 140.0 km.